Bible Games - Creative Bible Study - Below are some recommended Christian resources that will help you to find a fun-filled educating Bible family game that everyone will enjoy playing. 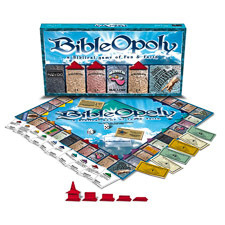 Here we have what most would consider an extremely fun Bible game to many will be able to sit down and play. Especially during the Christmas season. This game has tasks that deal with being the first to reach the Newborn King. But this will not be an easy task -- being that there are many pitfalls that one may find along the way. From may understanding of it, each player starts out with 5 shekels, as they find themselves having to navigate around a place, that goes by the name: "Trader Moe's Camel Parking." And all in all, this is being done, as a person is trying to complete numerous tasks that many see as being zany and humorous. Know that all of this is being done, as they attempt to make their way to Bethlehem. Now I also want to point out, that this game has a number of fun options, so don't be surprised, if you and your kids find yourselves playing this game all year round. Here we find the best selling game when it comes to verbal explosions, being transformed into a creative, fun-filled Bible edition! 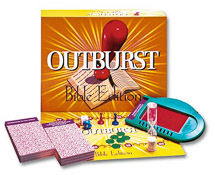 Most are saying that Outburst Bible Edition is a rip-roaring, hilarious party Bible game that's filled with many challenging and entertaining Bible topics. Know that each topic has its own 10 target answers. I wonder, how many will you be able to get? Now when it comes to this game, the fun begins when your team draws it's very first topic. Now these topics could deal with things, like the "Names for Christ" or were some of the "Animals in the Bible" or who were the "Sons of Jacob?" So on, and so forth... Then Pandemonium reigns out, as the 60-second timer is now turned over, as the verbal explosions begins. And even though your team will be pouring out answers, while also shouting out possibilities... remember that only the 10 target answers are able to score points. All in all, there are 252 topics, and the game only takes about an hour to play. So enjoy hours, upon hours of fun, when it comes to this non-intimidating, laughter-filled Bible game. Finally a Bible game that has been created, where you can enjoy the fun of a property trading Bible game, while you also learn about the many fascinating cities that are found throughout the Bible. Bibleopoly starts you off from the very beginning of God's Word. And then from there, you're able to travel through biblical cites that are known for Meditation and Community Celebration. But be careful, don't land in the Abyss! Now you can earn what they call a "Cornerstone" by helping a fellow player, or by doing community service. You can also make offerings in order to earn the necessary bricks and steeple pieces that you'll need, when it comes to building a church. The first person to build a church, wins! However, while you're trying to win the game, there are still some pitfalls that you must watch out for... like the "Go Meditate" spot that's on the board, because if you land on it, you'll lose three turns! And those three turns can definitely slow your progress. And unlike Monopoly were you must try to bankrupt your opponent, in Bibleopoly you are rewarded by doing the many good deeds that are found from throughout the game. So the more you're able to do, the chances of you winning the game, improves. I wonder just how many Bible categories can you match before time runs out? Know that the game of Scattergories has you rolling the letter die, so that you can determine the key letter for that round. For example: If you roll a letter "C". Know that the timer will now start. And after this happens, how quickly can you think of a place where Christ walked? Or what about a name for the Holy Spirit?.” Comforter. What if you can’t think of an answer that starts with the key letter? No problem. Just simply write down any answer, that fits the category and you still score points even if your answers are different from every other player. Remember, the player with the highest score after three rounds is declared the winner. 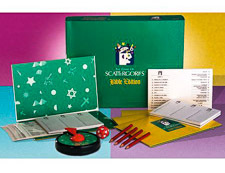 Scattergories Bible Game Edition is great family fun, and a real discussion starter, as you review your answers to categories such as "Things to forgive." Now most are saying that this game is not only entertaining, but that it also enhances one's faith, while promoting an healthy environment of learning. "How many times did Joash strike the arrows into the ground?" -- "Who was called a "mighty hunter before the Lord?" -- "What country did Abraham's servant go to find a wife for Isaac?" -- "What was Huldah's occupation?" And it's these types of fascinating questions that are not only fond from within this game, but answered as well. The Bible Challenge Game is a game that's filled with many hours of fun and learning! From the very beginning you'll be testing your knowledge of the Bible from within seven different categories. Now the goal to winning the the game, is to be the first person to score in all topics, and clear the final hurdle. I'll also like to point out that this game is easy enough, to where it doesn't matter knowledgeable you are when it comes to the Bible, everyone that plays the game will be able to have some taste of success. This way it cuts down on the participants becoming frustrated, therefore keeping everyone engaged, and their appetite for learning whet. 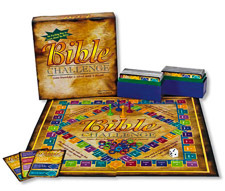 The Bible Challenge Game is also flexible, when it comes to its playing possibilities. For you see, you can make the duration of the game, as short and as simple as you like; or you can set the game up, to where you can truly test your knowledge of the game, by setting it up with more difficult requirements. 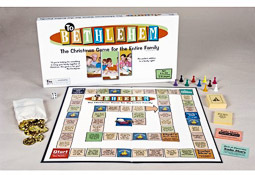 This very creative and exciting Bible board game, is idea for family game nights, retreats, or Bible study classes.